The Mars Pro are a series of triple filter Class II Cabinets, which incorporate the latest in laminator technology, energy-saving designs and construction, with HEPA-filtration giving the ultimate in protection for you, your products and your laboratory. A range of options are available to tailor the basic models to your exact requirements. 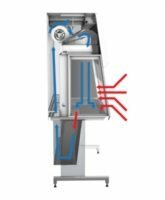 The air flow enters the biological safety cabinet work chamber via the front aperture and continues under the worktop, and up the rear plenum where 70% is recirculated through the two main HEPA filters, providing the down flow and 30 % exits out through the HEPA filter to exhaust. The vertical laminar flow recirculation provides Operator Protection by means of inflow, Product Protection by means of down flow and Environmental Protection by means of the filtered exhaust. The triple HEPA filter system ensures the elimination of any possible cross contamination. The air in the work chamber has to pass through two sets of main HEPA filters. 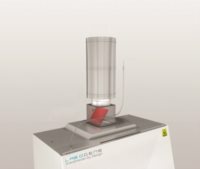 This makes the Mars Pro the ideal choice of cabinet for working with hazardous materials such as cytostatic, virus manipulation and category 3 pathogens. The Mars Pro cabinets are manufactured & tested in compliance with EN 12469. All models are available with a wide range of high-quality customized options to suit your individual needs or requirements. The Mars Pro cabinets take full advantage of the latest innovative energy-efficient fans and optimized air flows, contributing to lower energy consumption and reduction of the noise level. Lower energy consumption also results in less heat transmission, both into the work chamber and to the laboratory environment, contributing significantly to reduced overall energy costs. Do you need help to put together the optimal cabinet for your application? We are here to help you and are pleased to present our new product configurator, where you will be guided through the entire process of configuring the optimal cabinet matching your needs and requirements. Interested in knowing what the actual sound pressure level of your biological safety cabinet will be when taking into account influencing variables? Are you in doubt about what your Class 2 biological safety cabinet will consume of energy? Click here to calculate the energy consumption and see how much you will save!